In addition to ducks like the mallard shown here, we saw shovelers, blue-winged and green-winged teals, ruddies, pintails and gadwalls. For me, April 6 marked the end of a long and dreary winter. On that bright, clear day, Chris Hollister and I spent an hour observing waterfowl at the Iroquois National Wildlife Refuge Cayuga Overlook on Route 77. I had been by this overlook one afternoon a few days earlier, when I found only about 100 Canada geese. That same day, Celeste Morien had censused the marsh and recorded many more waterfowl. When I asked her about this, she told me I had to arrive earlier to find more ducks and geese before they moved out to feed in the farm fields of the region. And indeed on this morning we found plenty of waterfowl. While Chris set up his telescope, I panned the nearby marsh with binoculars, immediately picking out a half dozen shovelers in the foreground. Despite the big bill that gives this species its name, the male shoveler is a very attractive duck. 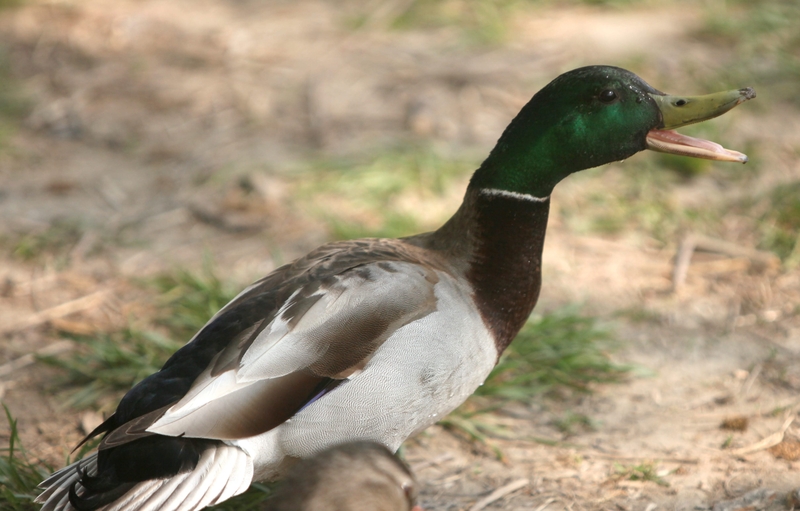 It has a green head like a mallard, but its most distinctive mark for me is the bright cinnamon of its side between the white of the throat and another white patch near the tail. In silhouette this gives the duck a five-part appearance from head to tail: green-white-brown-white-black. Of course, you don’t need all those field marks. The long, low appearance and the big bill are enough to pick out both male and female shovelers. Then I got a surprise. A small duck dropped in to join the shovelers. It turned to show a quarter moon white crescent on its face. It was a blue-winged teal, a bird I have had trouble finding in recent years. When I was young, the situation was quite different; then the commonest ducks were black duck, mallard and blue-winged teal. I don’t know why the populations of blue-wings and blacks have so sharply declined in the East, and game managers I have asked have been equally baffled. Just as surprising was the fact that I was, for the first time since I began birding, seeing this blue-winged teal before our other small dabbler, the green-winged teal. Green-wings usually appear a week or two earlier. While my attention was focused on the nearby birds, Chris was panning with his scope to identify more-distant waterfowl and he began to name them: ring-necked duck, American wigeon, gadwall, bufflehead, red-breasted and hooded mergansers, redhead and ruddy duck. He also found among the Canada geese two cackling geese, small duck-like versions of that clade. He gave me a chance to scope the cacklers and the ruddy ducks, both species new for me this year. Ruddies are pert little teal-sized ducks with a bright blue bill, white cheek, bright brown body and a stiff tail that it often holds upright. Early April is the time when ring-necked ducks and pintails are most common. I had plenty of opportunity to observe ring-necks that morning, but I missed pintails until a group of six took off and flew right in front of us. I find these two species among the most attractive waterfowl: the ring-neck for its upright posture – it reminds me of a child having been told by the teacher to sit up straight – and the pintail for its sleek body and fine markings, including the long tail feathers that give it its name. But then Chris said, “Look at this bird.” When I peered through his scope, I saw the handsomest of all the attractive ducks we had been looking at that morning. It was a male green-winged teal and the bright early morning sun set off its colors perfectly. Most of my friends agree that the wood duck and the pintail are our most attractive waterfowl, but I find this species their equal, with its cinnamon head divided by a green mask set off by the muted colors of its brown and gray sides. Like the blue-wing, it, too, has a white lunar crescent; however, its crescent is on its side between those brown and gray feathers. All this was against a background of thousands of Canada geese, many on the water but still more flying in long lines.